If your idea of biking in France is racing down a quiet autoroute at 100mph or 160kph, perhaps you should think again. Although some roads elsewhere on the Continent have no fixed speed limit, and any penalties imposed might not have any impact on your UK motorbike licence in terms of points or future increases to your motorbike insurance premium, don’t kid yourself that breaking the laws of the road in France can be free of consequence. At the moment, any transgressions you make while on the road outside of Britain will almost certainly not be translated back into penalty points on your UK licence. That does not mean, however, that the risks of speeding or otherwise failing to observe local motoring laws are minimal. If police or gendarmes stop you, they will generally have the power to impose ‘on the spot’ fines and you face paying hundreds of euros depending on the severity of your offence. Worse still you could lose your motorbike: police in France have the right to impound your vehicle if you are travelling more than 50kph (roughly 30mph) above the limit. Exceed the permitted rate by 40kph (25mph) and your licence could be confiscated. 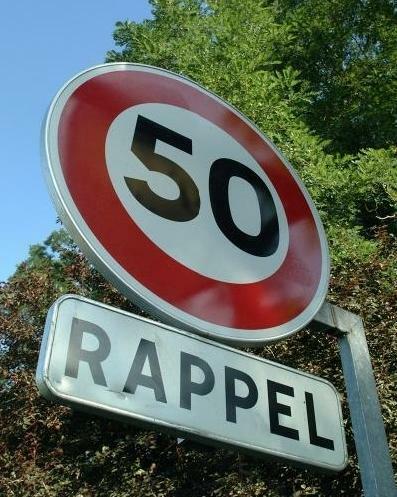 In built-up areas, a limit of 50kph applies in France; on motorways, the maximum is normally 130kph (around 80mph) but when it’s raining, the maximum allowed is 110kph (around 68mph). The Driver and Vehicle Licensing Agency (DVLA) in the UK has reciprocal agreements with fellow motoring agencies around the European Union, which means that you can be identified and contacted by any police force which has a record of your registration plate, for example from a speed camera. Legally speaking, however, a fine such as this cannot be enforced in Britain in the same way as a UK issued fine: foreign authorities cannot ask the British judiciary system to help them get their money. Should you tell your insurer about any foreign speeding fines when your motorbike insurance policy comes up for renewal? AA spokesman Ian Crowder says the answer may technically be yes, but that doing so could prove difficult. “A motoring offence that takes place outside the UK can’t easily be declared on your insurance renewal,” he explains. It is worth checking the small print on your policy to see what your insurer’s view is on disclosing speeding fines: if in doubt, give the company a call to explain what has happened. Jamie Gibbs of Confused.com, with which UK France bikers.com has recently entered into partnership agreements, has written this post.